In 1914, the University of Delaware established a course in chemical engineering. A century later, the Department of Chemical and Biomolecular Engineering is one of the leading academic departments at the University of Delaware and one of top chemical engineering programs in the United States. 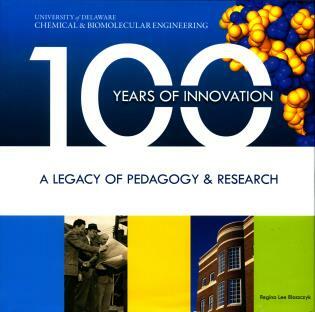 In 100 Years of Innovation, historian Regina Lee Blaszczyk examines the 100-year history of this “small wonder.” Based on interviews with faculty and alumni and on research in the university’s archives, the book explores how the course in chemical engineering evolved into a department within the College of Engineering. The book examines the leadership of chemical engineering pioneers such as Allan P. Colburn, Robert L. Pigford, and Arthur B. Metzner who as chairmen steered the department through the growth era of the Delaware Valley chemical process industries. It explores how the department adapted to the sea change that transformed the chemical industries and the discipline of chemical engineering during the recent era of globalization, with reference to new specialties such as energy, nanomaterials, and bioengineering. Regina Lee Blaszczyk is Leadership Chair in the History of Business and Society at the University of Leeds in the UK.